Save The Whales Again is an oceanic research, conservation and production organization dedicated to preserving and protecting dolphins, whales, and their ocean habitat. 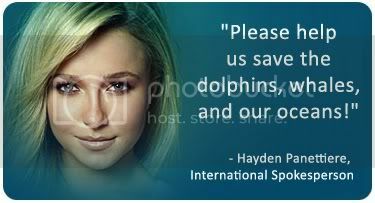 Hayden Panettiere is the spokesperson for the wonderful organization whose mission is To forever preserve and protect cetaceans (dolphins, whales, and porpoises) and their critical habitats. To perform long-term field research of cetaceans and their interrelationships with mankind in order to better understand the context of their lives for the betterment of all. To raise awareness to the issues that not only affect cetaceans, but all marine life, and the overall health of our oceans. To encourage individuals to explore there uniqueness, to share there talents, and to fulfill their dreams and desires. To share what we observe, learn, and value with the world. My goal is be able to donate at least $25 to this incredible cause. If you want to learn more about this organization, please visit http://www.savethewhalesagain.com/index.htm or check out the documentary, The Cove. I just wanted to say thank you so much to everybody who joined or donated to this cause. I am very passionate about it, and really glad to see that other people care too. medic, I know they are very cool. It just amazes me that they are actually self aware, like if they looked in a mirror, they know that it is themselves they see, they know exactly what they are looking at.